Re-opening of the Dome in September 1935, 14 September 1935: The Mayor of Brighton, Sidney Gibson, and other dignitaries after unveiling a plaque to commemorate the re-opening of the Dome on 14 September 1935. 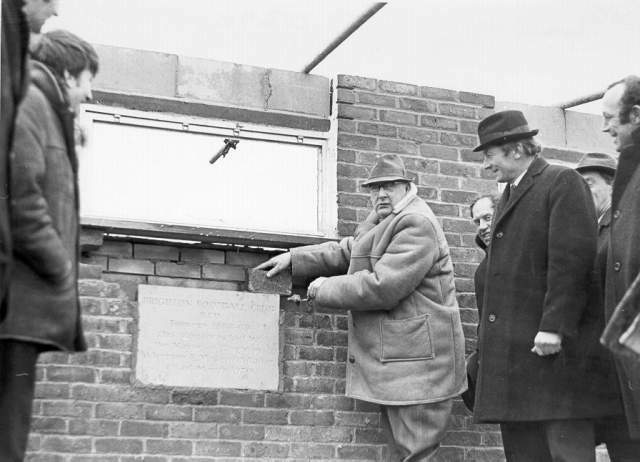 Laying Foundation Stone at Brighton Football Club , 1970: The Mayor of Brighton, Frank Masefield-Baker, laying the foundation stone of a new building for Brighton Football Club on 4 March 1970. Brighton Football Club are a rugby team, now based at Waterhall. 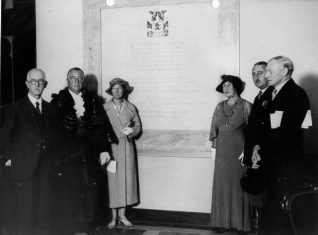 Since 1854 Brighton has been a chartered borough with a council chaired by a mayor, who, in the absence of royalty or the lord lieutenant, is also the sovreign’s representative in the town. Brighton’s first mayor was Lieutenant-Colonel John Fawcett who was elected at the first council meeting on 7 June 1854. The only person to have been mayor four times was John Brigden, in 1863, 1864, 1873 and 1874, but John Cordy Burrows was the first to be mayor both twice and three times. The first woman to become mayor was Miss Margaret Hardy in 1933. A complete list of Brighton’s mayors is given below; many names will be familiar with streets, roads, parks and flats named after them. Note that the dates shown refer to the year in which the mayors took office. Do you have any other information about John Routley, Mayor 1936 please? Paper cuttings or anything else would be great. Thank you. Are the two Clout Mayors in 1945 and 1964 the same person? Are there records of Hove Council in the 1950s and 1960s? My grandfather Alderman J L B Jayne served on Hove Council in those days and met the Queen when she visited Brighton on one occasion. He was chairman of the Health Committe and Road Safety Committee I believe. He was also involved in a life-saving idea for rescuing people from the sea – and invented and patented a traffic light changing device. He died aged 76 and is buried in Hove Cemetary. Hi My husband Paul Hayne.s mother was Syliva Poole, her mother was Lucy Marsh, her father was Ernest Marsh who I believe was Mayor of Brighton in 1949-1950 which would mean that Ernest Marsh was my husband’s great grandfather. Have you any information about him or any pictures of him it would be so lovely to add to our family tree which we are in the mist of. Do you have any information about my uncle William Marsh who was a shop keeper on Fisher St in Lewes? We also think he was mayor of Brighton and Hove. Was he married? When did he die? Did he have any children?